When Jack was a baby, in fact still now, I love shopping around for a bargain or two. I love to discover new baby and toddler sites, especially those with super bargains and clever ideas. As Jack was our first child and a bit of a shock baby, we kind of brought EVERYTHING. I'm sure those 'new born baby needs' lists are useless. So, I've already started to think about baby number two, who I would love to have now, but we don't plan to have until after we are wed! Next time round I hope to breastfeed, its the way I always dreamed of feeding my baby yet never even tried with Jack due to being young - yes I know no excuse. So I've heard many parents say it can be tiring on the arms, especially as they get older so I'm planning on buying a nursing pillow for support. 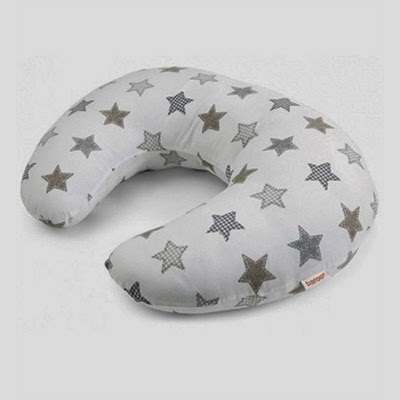 I love this neutral star pillow from Baby Thingz website. Of course I will need a new bed for baby, well Jack may even be in a big bed by then but I do hope hes in his toddler bed for a while longer. I like the idea of having baby next to us, although I'm not sure if Ashley will agree on this one but hey! I hope to get a bedside crib and then moving baby into a cot bed as that was literally our best buy with Jack. I think I tried to rush Jack growing up a little, I couldn't wait for him to move into his cot, then into his bed. I also couldn't wait for him to gain weight to change car seats, and pushchairs. I hope next time round we will take a more relaxed approach, and savoir our baby growing and developing, I mean if Ashley gets his way it will be our last baby. So this time around I plan to purchase an extended rear facing car seat. Obviously I'm just thinking of things I never used with Jack and will look into more depth when we are actually pregnant or plan to be rather sharpish. Hopefully not too much longer and the next year flies by.